Just as the sun started to rise, Duke Wilson and his nephew Parker slid into their battery-powered golf cart and headed out across the property. They do this most every morning to check the health of their seasonal crops, as well as the functioning of several operation systems. “Let’s take a picture here,” Duke said, as the men examined precisely laid rows of cabbage and kale. The younger man pushed the brim of his cap up from over his eyes and snapped a digital image of the plants. Cabbage and kale—sounds good, but these plants are not for eating. They are ornamentals, and along with a wide variety of other bedding plants just getting started, they are the Wilson’s crop. These and the pansies. Yup, pansies. Right now they have greenhouses full of pansies just waiting to find a new winter home. “Pansies are tough,” Wilson said. “They like the cold.” Perhaps it’s time to reconsider the little flower’s image. Located two miles west of Pottsboro on FM 996, Wilson’s Farm operates out of sixty-seven greenhouses spread across twenty-four acres. From their office in a large, orange, steel Conex shipping container with a door in the side, the images from that morning’s photo shoot were forwarded to Duke’s brother and Parker’s father, Tom Wilson. “He works out of the store in Dallas and has a real good knowledge of everything we grow,” Duke said. The store in Dallas is Christina’s Flowers, named for Tom’s wife. It’s located on Mapleshade Lane, near US 289 and the George Bush Freeway. There, Tom and ten-year staffer Kelsey London, receive the flats and set them out for retail. The bulk of the Wilsons’ Pottsboro product goes to stock this store, but product from Wilson’s Farm reaches consumers from Oklahoma City to San Antonio, too,. “In a season, we can send out 600,000 flats of annuals,” Parker said. The bunker-like office is headquarters for the farm, home to piles of paperwork, a computer monitor and a label making machine. Overhead, on a dry-erase board, a running list of maintenance projects grows as rapidly as the plants. “We’re the maintenance team, the plumbing team, the operations team. This is a family business and we do it all,” Duke said. Wilson’s Farm got started forty years ago when Tom and Duke’s father, R.C. Wilson, purchased the Pottsboro property. The boys took a liking to the country life and at one time lived there. Tom and Duke have both been a little of this and a little of that—landscapers, concrete workers, and sprinkler-system installers. As a hobby, Tom began putting his horticulture education to use and began planting on the farm. “He’s always had a knack for working with plants,” his brother said. Over time, they built six wood-framed greenhouses, and the Wilsons began taking their crops to market. They also sold plants on the street. “We would go to Florida and pick up a truck load of plants and sell them on corner lots in Dallas,” Duke said. The brothers found that they could unload a truck full of exotic house plants within hours. “We just sat down one day and talked. We realized we were selling a lot of plants and that we couldn’t keep our jobs and continue to do this. So we made a decision to get in the greenhouse business. Then we hired some people and made it work,” Duke said. There are sixty-seven houses now, lined up in rows and covered in a layer of heavy-gauge Visqueen® poly sheeting. At both ends of the houses sit large turbine fans, used to exhaust the warm interior air during the summer. If the temperatures soar, the Wilsons use shade cloths to cut the heat. Too hot in the summer, too cold in the winter has always been the farmer’s challenge. “When we get a real hard freeze, I have to get out here and check the heaters in every house. It’s worth getting up at 1 a.m.,” said Duke. 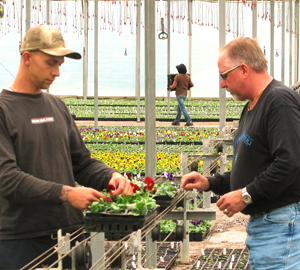 Planting is a continuous operation at Wilson’s Farm. Truckloads of peat moss arrive in bundles, and seeds are purchased from various suppliers. Most of the plants are grown from seed. Want to Leave a Comment about Wilson’s Farm? Just click on Leave a Comment below. The automation process begins once the tightly compacted bundles of peat moss are dropped into a bail busting machine and reduced into a workable medium. A machine that definitely has the “shakes” sifts the peat into 384 pinky-sized plug holes on a plastic tray as it moves along a conveyer. Each tray is watered, seeded, and packed. A fine layer of vermiculite coats the finished trays, which are then stacked on rolling racks to be organized in greenhouses. Under ideal conditions, and depending on the crop, buds will poke out of the moss in three to four weeks. Once the buds have made a leafy appearance, they are then replanted from the plug trays into eighteen-cell finish flats. Through the years, and after attempting several different procedures to perfect the replanting process, the Wilsons’ found that a crew of six replanting along a conveyor is ideal for production and cost. “We had an automated machine some time ago doing this for us, but once the machine went down, we were left with a whole lot of crop and no home for them,” Wilson said. Now they employ six young women, who sit alongside the conveyor wearing latex gloves to keep their hands from drying out, and as flat after flat moves past, they delicately but quickly replant the sprouts into finish trays. The women laugh and talk as they work, but if something goes amiss, the straw boss—or would that be moss boss—Raquel Vargas steps in and makes it right. “This is a family operation, but she’s the boss,” Duke said of Vargas, who has been with the Wilsons’ for more years than she or Duke can quickly recall. Cabbage and kale are winter favorites and for color—remember those pansies—well, the Wilsons sell 100,000 flats of pansies each year. Spring sees traditional favorites such as marigolds, petunias, and periwinkle. But their cash cow, as they’ve come to find over the years, is the red-leaf begonia. “We’ve tried a lot of different things, but our number one seller is the red-leaf begonia,” Wilson said. As they stay on top of customer trends, the Wilsons see the fluctuation in consumer purchases. Pots of wisteria occupy a small space now, remnants of a trend that was popular five years ago. In 2009, the potato vine emerged as a hot-selling item. “We’ve gradually refined what people are looking for,” London concluded. Back at the farm, Duke and Parker, after a long day babysitting baby plants, turned the golf cart back to the barn. They put away their tools, added a couple of new items to the never shortening list of maintenance chores, and checked the computer for updates. Parker Wilson lifted the brim of his cap and squinted into the sun hanging low on the western horizon. It was time to go home. I love Wilson Farm! Just picked up a some fall color at Christina’s yesterday in fact. Mums are looking great this year! Joan Douglass once believed that wall-to-wall carpeting and a white telephone were evidence of a successful life. That was when she and her husband Bill were first married and had few assets other than their love for each other.